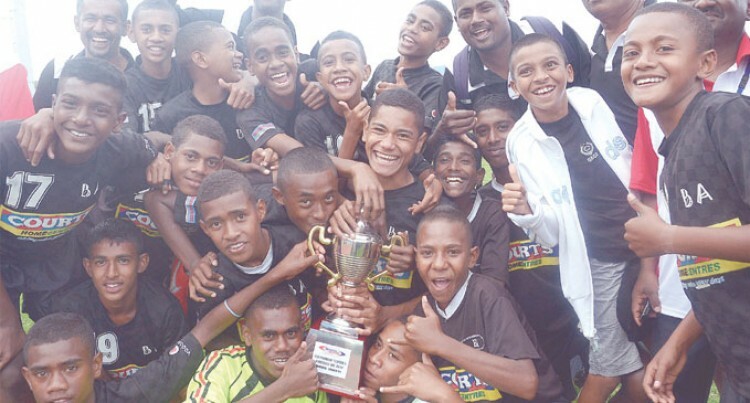 Ba is the new champion of the Fiji Primary Schools Inter-District Championship Under-14 grade. This was after the Kids in Black beat Lautoka 1-0 in the CJ Patel sponsored event. Lautoka earlier defeated Ba in the pool match 1-0 on Day One and proved themselves as the team to beat in the competition. But this was denied yesterday by the Ba side. Both teams were locked nil-all at halftime. But Lautoka failed to stop Ba’s striker Jone Sukulu from scoring in the second half. The Ba forwards played a good game throughout. Jone Sukulu scoring the winner for Ba. Winning coach Timoci Seru said the players deserve the praise. “The boys played their hearts out and they have sacrificed a lot during training and we want to dedicate this win to the Ba district knowing that our district team is not doing well at the moment. But this is something they will have to celebrate. “We want to thank our parents, head teachers, Ministry of Education and all the fans for their support. Lautoka Primary School Football president Hirdesh Kumar said their boys played well but luck was not on their side. “I’m happy with their performance, we thank the parents and Ministry of Education for allowing the children to participate.